« The Calendar Road January, 2014. 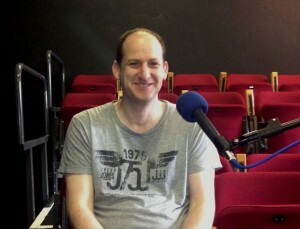 Paul Meade is a writer, director, actor and artistic director of Gúna Nua theatre. From Limerick, Paul trained at the Samuel Beckett Centre, Trinity College, received an M.A. in modern drama from U.C.D. As a director Paul has directed the award winning Little Gem and ‘Scenes From a Water Cooler’ (co-directed with David Parnell), Taste, The Real Thing and Trousers for Gúna Nua. He has also directed ‘Translations’ for Hands Turn Theatre, ‘Medea’ for Threshold, Death and the Maiden for Mirage and most recently David Mamet’s ‘The Shawl’ for Bewley’s Café Theatre. Wrath’ for 7:84 Scotland; ‘Hamlet’, ‘Romeo and Juliet’, ‘The Tempest’, ‘Someone Who’ll Watch Over Me’ and more with Island; ‘Romeo and Juliet’, ‘The Merchant of Venice’ and ‘Macbeth’ with Second Age; ‘Hard Times’ for Storytellers; ‘God’s Gift’ with Barrabas; ‘The Glass Menagerie’ for Galloglass and ‘Alone it Stands’ with Yew Tree Theatre. Film and Television include: ‘Alarm ‘by Gerry Stembridge, ‘The Clinic’ and ‘Whistleblower’ for RTE, ‘The Tudors’ for BBC, ‘Lassie’ for Classic Media Productions, ‘Love is the Drug’ for RTE, ‘Quando’ for Paradox Pictures, ‘Making Ends Meet’ for Indie Films, ‘Rebel Heart’, BBC and ‘On Home Ground’ for RTE. To listen now click PLAYor PLAY IN POP UP to listen later Right Click/Ctrl Click and Save Target As to download and listen later. This entry was posted on February 5, 2014, 12:03 pm and is filed under Civic Theatre Sessions. You can follow any responses to this entry through RSS 2.0. You can leave a response, or trackback from your own site.